You can finally cut the cord! The FLEX XFE15 150 Cordless Orbital Polisher is an orbital polisher with a 15 mm throw that will remove swirls, scratches, and more from your paint – all without having to plug in a cord! 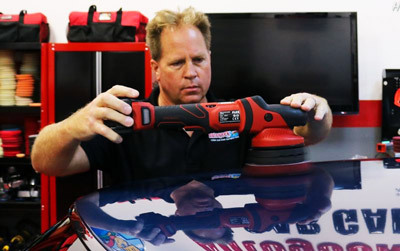 Months of development went into the construction of the FLEX XFE15 150 Cordless Orbital Polisher – FLEX needed to make sure the power of the standard FLEX XFE was seamlessly transferred to the new cordless edition; and they’ve certainly succeeded! With an average full-power run time of approximately 45 minutes, the FLEX XFE15 150 Cordless Orbital Polisher allows you the ability to perfect panels of paint – without being plugged in! Cords can be a real pain. Polishing a car with a corded tool always runs the risk of knocking the cord against the surface you just correct – you may have to go back and do that section all over again! We’ve seen aprons with cord holders, detailing belts with cord holders – but what if the machine had no cord in the first place!? FLEX has manufactured two of their bestselling polishers (the FLEX XFE and the FLEX PE14), as cordless, battery-operated systems. Powered by either a 5 amp or 2.5 amp (both cordless machines come with two 5 amp batteries, but the 2.5 amp battery is available for purchase separately), lithium-ion battery, the FLEX XFE15 150 Cordless Orbital Polisher packs just as much of a punch as it’s corded counterpart. Still featuring the power of it’s corded counterpart, the FLEX XFE150-150 Cordless Orbital Polisher let’s you cut the cord and polisher where you want! The FLEX XFE7-15 Long Stroke Orbital Polisher is a free spinning model, meaning that there is no forced rotation like its older brother, the XC3401. The FLEX XFE15 150 Cordless Orbital Polisher features the same long throw and makes correcting and polishing paint easier than ever. The FLEX XFE15 150 Cordless Orbital Polisher, when powered by the 5 amp battery pack, can polish for up to 45 minutes of heavy use – more than enough time to polish 3 full panels! If you’re looking for more mobility, less hassle, and a painless polishing experience – it’s time to cut the cord – FLEX XFE15 150 Cordless Orbital Polisher. Maximum polishing pad: 160 mm. Maximum backing pad: 150 mm.